Acclaimed New York Times bestselling author Jennifer Haigh returns to the Pennsylvania town at the center of her iconic novel Baker Towers in this ambitious, achingly human story of modern America and the conflicting forces at its heart—a bold, moving drama of hope and desperation, greed and power, big business and small-town families. Forty years ago, Bakerton coal fueled the country. Then the mines closed, and the town wore away like a bar of soap. Now Bakerton has been granted a surprise third act: it sits squarely atop the Marcellus Shale, a massive deposit of natural gas. To drill or not to drill? Prison guard Rich Devlin leases his mineral rights to finance his dream of farming. He doesn’t count on the truck traffic and nonstop noise, his brother’s skepticism or the paranoia of his wife, Shelby, who insists the water smells strange and is poisoning their frail daughter. Meanwhile his neighbors, organic dairy farmers Mack and Rena, hold out against the drilling—until a passionate environmental activist disrupts their lives. 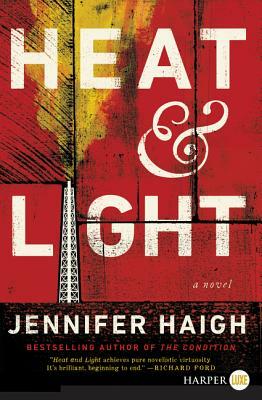 Told through a cast of characters whose lives are increasingly bound by the opposing interests that underpin the national debate, Heat and Light depicts a community blessed and cursed by its natural resources. Soaring and ambitious, it zooms from drill rig to shareholders’ meeting to the Three Mile Island nuclear reactor to the ruined landscape of the “strippins,” haunting reminders of Pennsylvania’s past energy booms. This is a dispatch from a forgotten America—a work of searing moral clarity from one of the finest writers of her generation, a courageous and necessary book. Jennifer Haigh is the author of the short-story collection News from Heaven and four critically acclaimed novels: Faith, The Condition, Baker Towers, and Mrs. Kimble. Her books have won both the PEN/Hemingway Award for debut fiction and the PEN/L.L. Winship Award for work by a New England writer. Her short fiction has been published widely, in The Atlantic, Granta, The Best American Short Stories, and many other places. She lives in Boston. “We finally have a novel - and a novelist - whose ambitions match the scale of this subject…a tour-de-force of multiple point-of-view narration…DeLillo-esque…Haigh’s achievement in this expansive, gripping novel is to delineate the ways in which we are all connected, for better and worse.